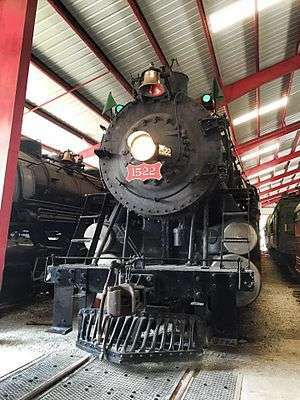 St. Louis-San Francisco Railway 1522 is a two-cylinder, simple 4-8-2 Mountain-type steam locomotive built in 1926 by the Baldwin Locomotive Works for the St. Louis-San Francisco Railway. It was retired, and in May 1959 donated to the Museum of Transportation, St. Louis, Missouri, where it is currently on display. It was returned to operational status in the spring of 1988 and operated excursion rail trips until the fall of 2002 when it was placed back into retirement at the museum. The 1522 was built to handle Frisco's heavier passenger trains through the hilly Ozark regions. Five other examples of Frisco Mountain-type locomotives are preserved today throughout America. Many railfans regard 1522 as the "The Loudest Steam Locomotive in the World" due to its exceptionally loud exhaust blasts, particularly when working hard. St. Louis-San Francisco 1522 was built in 1926 as part of the third order of Mountain locomotives for the St. Louis-San Francisco Railway. Purchased for $70,000, the locomotive was built to handle heavy passenger and freight services along the Frisco Railway's Eastern and Western Divisions.